Stainless Steel Handrail Support 2 3/4" Dia. x 1/2" Dia., for Tube 1 1/2" Dia. Stainless Steel Handrail Support Rigid, With Mounting Plate for Tube 1 2/3" Dia. Stainless Steel Handrail Support 2 3/4" Dia. x 1/2" Dia., Pivotable, for Tube 1 1/3" Dia. 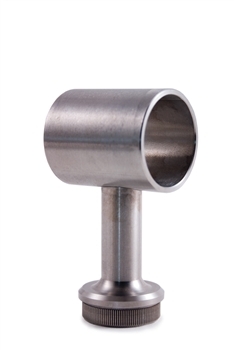 Stainless Steel Handrail Support Includes Flange, Flange Canopy Stainless Steel Handrail Support 2 61/64" Dia. x 1 2/3" Dia., Pivotable, for Square Tube 1 9/16" Dia.